Chile, 1948. The poet, communist and senator Pablo Neruda (Luis Gnecco) has become a thorn in the side of the government and President Gabriel Gonzalez Vidala (Alfredo Castro), a man he helped elect. Clampdowns on subversives, trade unionists and strikers make Neruda’s continued parliamentary role untenable and the choice is either to flee or to accept the inevitable prison term. Guided by his Communist Party associates and his artist wife Delia (Mercedes Morán), Neruda makes several abortive attempts to escape, holing up in the meantime in poky safe houses along the way. Meanwhile, a police inspector Oscar Peluchonneau (Gael García Bernal) is tasked with finding and arresting the fugitive whose name is now pasted on the walls of the cities with accusations of treachery and subversion. Peluchonneau is himself a cypher, a blank page, a poem waiting to be written and, as the cat and mouse of his chase begins, a magic realism soaks into the film as Oscar and to some extent Pablo comes to believe that their roles are essentially fictional. Neruda, whose real name is actually Neftali Ricardo Reyes Basoalto and who recites his poems in a specific theatrical voice (his poet’s voice), suspects that the government has rallied its manhunt only as political theatre. The other subversives, the little-known union organisers and ordinary workers are beaten, arrested and trucked into the desert where a young Pinochet is learning his murderous trade as a prison commandant. A captured Neruda would be an international embarrassment: Pablo Picasso (Emilio Gutiérrez Caba) is already championing the poet’s cause overseas. So maybe they wish to murder him? Or let him escape? Neruda’s own dithering leads one bodyguard to suggest he’s guilty of his own theatrical grandstanding and Neruda delights in ordering close shaves designed as much to humiliate the authorities as facilitate his getaway. Compulsively, Peluchonneau reads Neruda’s poems and writing, taking on his own persona from Neruda’s lead. A literal son of a whore, Peluchonneau believes – however dubiously – that his father was a legendary policeman with a statue. Like Alain Delon in Le Samurai, he seems as concerned with the angle of the light, the tilt of his hat and the state of his cigarette as he is with finding Neruda. 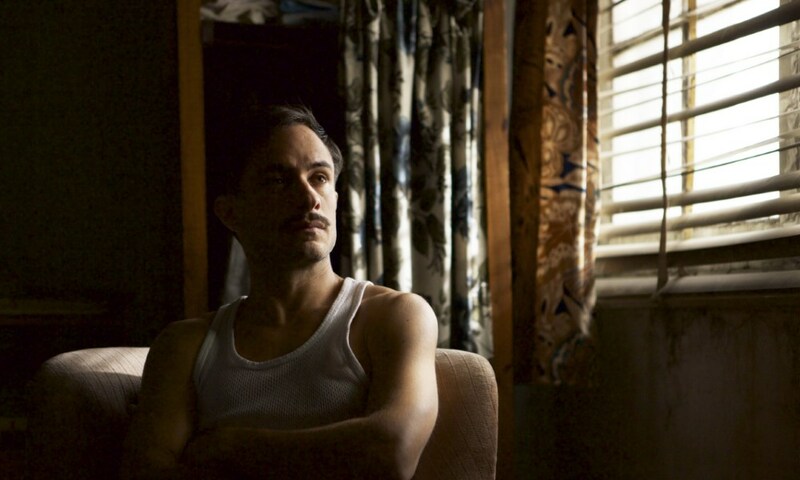 It’s Peluchonneau who narrates Pablo Larraín’s Neruda – acidly critical of the leftist intellectuals, the champagne socialist who he believes would scamper at the first sign of a real revolution and devoted to his President and superiors. Despite this control, it’s clear that the narration is partly hard-boiled detective posturing and partly the mutterings of a fictional policeman who is discovering his own fictive status. This postmodern unreliability is emphasised by Larraín’s wonderfully inventive direction. Car journeys trundle by with old fashioned back projections and the same scenes are played out in different locations with changes of light and resolution. There’s often a rich, almost lush texture to Sergio Armstrong’s cinematography – reminiscent of peak Bertolucci – and at others the screen is leached of colour, desaturated as if these are old photographs that have lain in the sunlight too long. Larraín reminds us constantly that this is all invention, a film, but all the while we are following Peluchonneau as he follows Neruda with the same conviction of some kind of hope. Strangely, what began as a biopic somehow transforms into something more akin to a quest. Leading that quest, Bernal is exemplary. His inspector is at once the cop who might in a few years be leading the death squads, but he is also at the same time the little boy abandoned to history, claiming his place. There’s a comic lightness and a deadly serious conviction even as his own character becomes increasingly unsure of his own reality. Gnecco has both breadth and subtlety. His Neruda is a complex and fascinating character study, a man fastidiously vain of his status but unconvinced by his own performance even as he enraptures a nation. The BFI London Film Festival takes place from 5-16 October. Book your tickets at bfi.org.uk/lff.